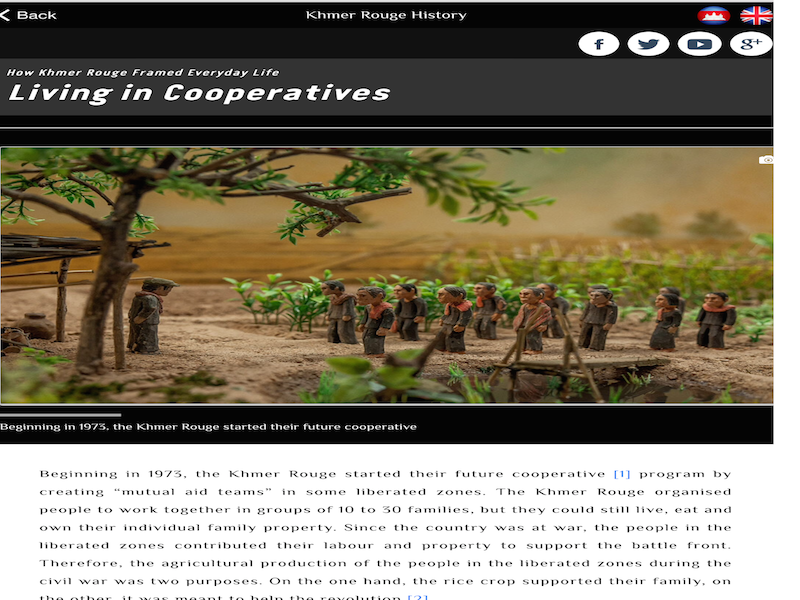 The first mobile app offering a comprehensive and interactive history of the Khmer Rouge, created in the hopes of ending a “collective denial” about some of the atrocities committed by the Pol Pot regime, went live on Tuesday. Developed by the Bophana Audiovisual Resource Center in Phnom Penh, the app traces the communists’ roots in the 1950s up to the ongoing cases against the regime’s surviving leaders at the Khmer Rouge tribunal. The easy-to-use app weaves archival photographs, videos, propaganda music and paintings, with historical text compiled by researchers, over eight chapters and 39 subchapters. Free to download, it was available on Tuesday on Android by searching for “Khmer Rouge History” and was expected to be released shortly on iOS. The app will also be used as a teaching aid for history lessons on the period in high schools and universities. Seventy percent of the Cambodian population is under the age of 30 and teaching about the Pol Pot regime in the country’s public schools has long been very limited. Sopheap Chea, an audiovisual archivist at Bophana, spoke of his pride that the app had been developed by Cambodians. “There is a lot of pride for…Cambodian technicians because before we all know Khmer history has been written by non-Cambodians, but now it’s kind of a new development that Cambodian people have developed,” he said at the launch. Keo Duong, a researcher who co-authored the app’s text, said the development team did its own research. “We conducted interviews with the cadres of the Khmer Rouge, so all those are the sources that we used to be able to analyze and write into text,” he said. As to whether the app deals with contentious issues, such as international complicity in the rise and support of the Khmer Rouge, Rithy Panh, the renowned Cambodian director and co-founder of Bophana, said that it could not cover every aspect of the regime, but could act as a catalyst for greater understanding. Bophana, in collaboration with the Education Ministry, will offer a program about the app in five provinces starting in October with the aim of reaching 30,000 to 40,000 students at 80 high schools and 20 universities. It hopes the app can tally 200,000 downloads internationally.